We’d love your help. Let us know what’s wrong with this preview of A dog eat dog-food world by Suresh Chandrasekaran. A hilarious pseudo-history of marketing management, which explicitly denies resemblance to any actual history, and which will be horrified if some semblance be found. ‘A dog eat dog-food world’ is the story of a man who discovered that the path of life is strewn with treadmills and, if you get on one by mistake, you could keep running all your life to stay in the same plac A hilarious pseudo-history of marketing management, which explicitly denies resemblance to any actual history, and which will be horrified if some semblance be found. ‘A dog eat dog-food world’ is the story of a man who discovered that the path of life is strewn with treadmills and, if you get on one by mistake, you could keep running all your life to stay in the same place. The story of how just minding your own business can lead to unexpected consequences, guided by the ‘invisible hand’ of long dead economists. Anything you learn from the book – be it the basics of marketing management or a satirical view of Society – you do at your own risk. To ask other readers questions about A dog eat dog-food world, please sign up. This is one of the most humorous books I have read in recent times. I guess people who read Dilbert might have found some similarity in the cover design. The idea of the book is also similar - a corporate parody. While Dilbert consists of individual standalone comic strips, in this book Suresh has knitted it all together in one complete story line. The story is set in an imaginary world that Suresh calls the alternate history and gives funny explanations on the origin of various management conce This is one of the most humorous books I have read in recent times. I guess people who read Dilbert might have found some similarity in the cover design. The idea of the book is also similar - a corporate parody. While Dilbert consists of individual standalone comic strips, in this book Suresh has knitted it all together in one complete story line. The story is set in an imaginary world that Suresh calls the alternate history and gives funny explanations on the origin of various management concepts such as market segmentation, pricing, brand recall, market research, management consulting et al as the reader is taken through the fascinating tale of the business battle between the tycoons Tom and Spike. Suresh, a management professional himself complete demystifies all the complex management jargon in his totally irreverential take. The book has variety of humor that works at various levels - one obviously is the slapstick kind one can come to expect in a story that has something to do with animals. Then we have the ludicrous explanation for origin of management concepts that actually might be a reflection of the real origins. We also have funny situations in the story that any one who works in the corporate world can directly relate to based on personal experience. Then there are some aspects that along with making one laugh makes one reflects on one's motivations, professional choices and broader purpose in life. This is not all - there is further humor hidden in terms of the choice of names for characters and some of the throw away lines in the dialogue for the more perceptive reader. Ah! Well! It is my book. I have reviewed my review after reading this book one year later and I updated it now. Keeping both the reviews here. 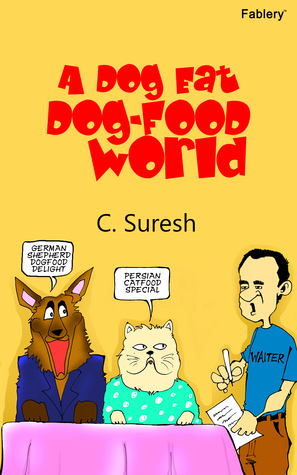 A Dog Eat Dog-Food World by C.Suresh was silently published a year ago. A slim book. Only some 90 pages long. But so good that I couldn’t ignore reviewing it. I had read it when it was published and then read again a few months back. And I realized that when your view about a book changes drastically upon multiple readings, it must be too layered to be understood in the first read. Hence, though I did write a short review on Goodreads a year ago, I think, it deserves a more elaborate treatment. Incidentally, difficult though it must be to believe, the world was not always run by computers and a cell-phone was not something that could only be removed from the body by surgery. People with no money knew what to do with the money, which they did not possess, but people with money seemed merely to be burdened by it. Something was seriously wrong with the disbursal system in Heaven. Anyway, to find the right business Spike Fortune (yes, what a name!) recruited his nephew Jerry. And thus the concept of boss and subordinate came. “You are not paid to think, Jerry! Just do as you are told.” Spike did not realize that he had just set the conversational trend for all employers for some time to come. And what was the business? Yes, as the title suggests, the dog-food! And here, the author brings out some excellent descriptions which are humorous, vivid and full of allusions. Thus brooding, Jerry moodily kicked at the ground – as human beings are wont to do when they are unable to kick the reason for their worry. Only, the ground seemed a bit squashy and, before Jerry could even take that message in, his entire horizon was full of teeth and fur and a deafening growl. When the barking turned suddenly into a duet, he looked around to find a stout middle-aged man also barking at him. It was then that he realized that a chain connected the dog and the man, which meant that one of them was the other’s pet. But for that chain, Jerry would have been minus a nose by now. Jerry froze. Had he been a character in a comic, a bright light would have lit up above his head. Then, he jumped up yelling unoriginally, “Eureka”, tripped over the hot water tub and fell down full length. Unlike Archimedes, who got his idea in his bath, Jerry had a bath on getting his idea, with the contents of the hot water tub inundating him. There are more on employer-employee relations and office politics. Like appearance of effort is more important than the effort itself. He was happy that Jerry had done enough work to write a big report but it was too much to expect that he should have to do the work of reading it. “The project report for the business, Uncle”, said Jerry. “D.. D.. Dog foods”, said Jerry, thereby creating the world’s first executive summary. First thing that happened after the introduction of the cat food, apart from huge sell of the product, was the division of class based on having dog-food. Also, of course, dog-lovers had now become stratified into the upper class of those who fed dog foods to their dogs and the lower class of those who did not. And as often happens, when one business flourishes, other similar businesses open up and become rivals. Cat-food Inc was born. The rival was Tom, Spike’s childhood friend. To keep score against your rival, what you do? You come up with market research. And thus, scientific market research came into being. They surveyed the customers and they found that the dog-owners’ responses to their dog-foods were based on how the owners’ days had gone, not whether the dogs liked it. Subtly, the author hints at the real face of market-research; it is more about how the customer feels than how the actual consumer feels. “My Rosie... she is so cute... when I give her the food, she licks it... so daintily you know... then rolls her eyes like she is in Heaven... then... she is so clever... she gets her tongue around one morsel and.. crunch... she just loves that sound...” and so on and so forth. From which, the young men came to the conclusion, quite rightly, that the entire process of Rosie’s meal was the highlight of her owner’s day. Though it said nothing much about Rosie’s preferences or about what the dog enjoyed the most. As expected, slowly but inadvertently, the concept of advertising came next. Not only it shows the rise of advertising in every corner of our life, trying to get our attention as much as possible, it also shows how it affects our thinking. Every time they fed their dogs leftovers, they felt like that brutal man who denied his poor dog the chance to eat good food. Every time they looked at their dogs, it seemed as though they were looking accusingly at them and complaining of ill-treatment. They had to give in. Similarly, the corporate jargon emerged, to show an utterly simple matter in a complicated language. “Incomprehensibility is wisdom” – seemed the mantra. No wonder management degrees have such high demand. Later, they went on to advertise the idea of dog as a protector or cat as a mice-eater. Glorifying dogs would glorify its keepers i.e. the owners. In other words, whatever is good for the dog was good for the owner. On closer inspection, you see, such things are shown everywhere – be it a smartphone company or a deodorant manufacturer. Having a smartphone means you’re smart, applying a particular deodorant makes you a real man. The dog-show, like a tech-fest, did just that. To win prizes in dog shows bestowed an aura on the winners that almost rivalled Royalty. The erstwhile door-to-door salesmen worked to such good effect that the entire country did all the other trivial jobs associated with living in Society – like agriculture - in the brief intervals between dog shows. It doesn’t end here. This concept is further broadened later – to spread the goodness of feeding your dog the proper food throughout the world – and voila, we have the concept of colonization. The crowning glory would come when it started determining what you ought to wish for and thrust it on you. Both ladies would then look at each other with horrified pleasure. So we see that though on surface it seems a mere fun story of how two rivals of pet-food compete, many darker, more complicated issues are subtly hidden underneath. And only upon carefully studying these lines, one would be able to truly appreciate how layered this deceptively simple looking novella is. After a long time, I have read a work of satire that is so good that it can stand proudly with other great satirical works. I am quite amazed about this little masterpiece and I hope that a work like this would be widely read and appreciated. A Dog eat Dog food world is no run of the mill book, and for readers starved for genuine humor and satire—I would recommend it without a moment’s hesitation. Blurbs claim a lot of things, promise even more, but more often than not a reader will feel cheated. In this case, the claim that this is a hilarious take on marketing management is amply justified. The way the characters are introduced and developed (keeping in mind that this is a novella) is remarkable. You begin to feel you are on a roll A Dog eat Dog food world is no run of the mill book, and for readers starved for genuine humor and satire—I would recommend it without a moment’s hesitation. Blurbs claim a lot of things, promise even more, but more often than not a reader will feel cheated. In this case, the claim that this is a hilarious take on marketing management is amply justified. The way the characters are introduced and developed (keeping in mind that this is a novella) is remarkable. You begin to feel you are on a rollercoaster of subtle humor and for a change you don’t want to get off, you want the roller to coast along. Mrs. Fortune hoping that Death would stop hovering around and for a change do its darned job, Fortune’s reactions to the various options placed before him to escape from ennui, and the way he does a remarkable Don Quixote tilting at ‘tread’mills keeps you smiling. I have been and always will be a huge fan of PG Wodehouse, and I have long lamented the fact that there has been no one who has taken up his mantle. PG had a unique style of writing and he had the ability to make you smile and chuckle without trying too hard. I know comparisons are odious and will refrain from doing so, but I can’t stop myself from saying that Suresh Chandrasekharan in his own inimitable style brings back memories of the Master. The way he has melded different marketing concepts in a satirical way into a story that is gripping in and of itself is remarkable indeed. Though knowing that this was a satire, a witty one, on marketing, I found myself rooting for Spike. I saw his transformation from a laidback hypochondriac to a raging trump’esque tycoon. How the mighty are fallen?! This transformation aided along most unwillingly by his nephew, Jerry, and provoked by his arch rival, Tom Rich is written with such skill and droll humor that it makes it almost impossible for you to put down the book. Fact—I read it in one go, and wasn’t really happy when it ended—book lovers will agree with me that a good book should go on and on! My sincere appreciation to this talented gentleman for his incisive wit, his admirable command over the language, his ability to marry humor with marketing strategies, which is by no means an easy thing to do -- Mark Antony wouldn’t have minded making the last speech. It would indeed be a pleasure to recommend this book and I am pretty certain that readers in the corporate world and out of it too will find it quite an engaging read. It isn't often that I come across a new writer who is able to wield the level of savage wit that I found in 'A Dog Eat Dog-Food World', and I consider my discovery of Chandrasekaran one of the really happy accidents of 2015. With the piercing observation of the true writer, Chandrasekaran homes in on every ridiculous feature of our consumer culture. Caricature is not at all easy to do well; it is very difficult indeed to avoid overdoing it and descending into gross farce. It calls for great delic It isn't often that I come across a new writer who is able to wield the level of savage wit that I found in 'A Dog Eat Dog-Food World', and I consider my discovery of Chandrasekaran one of the really happy accidents of 2015. With the piercing observation of the true writer, Chandrasekaran homes in on every ridiculous feature of our consumer culture. Caricature is not at all easy to do well; it is very difficult indeed to avoid overdoing it and descending into gross farce. It calls for great delicacy and precision in the writer, and in this case the call is not made in vain. Mr Chandrasekaran has, I believe, spent most of his working life in the world of industry and commerce, but one can only see that as the loss of the literary world, and hope that the loss will soon be remedied by more excellent books. If I had to compare this book to the work of an established writer, I should choose Evelyn Waugh, and the comparison is not made lightly. Anyone who has worked in the corporate world, unless indeed he is one of those who have succumbed to the corporate myth to such an extent that his mind has been purged of all humour, is bound to giggle with delight all the way through this riotously funny book. It probably ought to carry a warning that it should not be read on public transport. At the same time, while entertaining the reader to the point where asthmatic readers would do well to have their medication at hand, the book actually lays out the principles of marketing as it works in today's society in a very precise and understandable way. Humour aside, it could be used as a first-year textbook for marketing students. If only I had had this book at the time I was hired to head up a marketing department, I might not have been ignominiously fired after three months. One doesn't often see such a combination of sheer entertainment and useful information. Interesting book, different from the run of the mill romance/ slasher horror books. The book narrates the dilemma, and stark realities of the corporate world, using humour/ satire as the medium. Certainly recommended! This has to be one of most intelligent books I have read in a long time! Add to that the generous heap of humour- nope, not ‘in-your-face’ kind of humor, not slapstick humor, but the classy Wodehousian kinds…AND immaculate grammar (I haven’t seen people use such grammatically delightful sentences these days either!! ), and before I forget, there’s almost the entire Philip Kotler…dipped in gooey chocolate. The writing is smooth, the ideas flow uniformly, uni-directionally, and that is so important This has to be one of most intelligent books I have read in a long time! Add to that the generous heap of humour- nope, not ‘in-your-face’ kind of humor, not slapstick humor, but the classy Wodehousian kinds…AND immaculate grammar (I haven’t seen people use such grammatically delightful sentences these days either!! ), and before I forget, there’s almost the entire Philip Kotler…dipped in gooey chocolate. The writing is smooth, the ideas flow uniformly, uni-directionally, and that is so important because one can tend to go all over the place especially when humour is such an integral part of the book and gets incorporated along with a story and a lots of management lessons! The author gives us some great insights into his characters and life at the same time, tinged with subtle sarcasm and classy humour. The story is enjoyable, in a certain ‘have-been-there-have-done-that’ or ‘have-experienced-that’ kind of way- be it as the dumb boss Spike, to whom even concepts in plain English sound like Swahili, the poor subordinate Jerry who’s suddenly thrust into limelight, except without any light, or as Tyke who is intelligent enough but yet not enough to make any sense to his boss! And then there’s Tom the rival, unwillingly dragged into the game of one-upmanship and his even more unwilling subordinate Jasper. People who have seen the ugly underbelly of corporate life will tend to nod their heads assertively at every scene. The plot is hilarious to say the least, Kotler would probably now be wondering why he didn’t think of such an innovative and humourous way to teach us his principles! Be it a satirical face of the society or the basics of marketing management, the plot smacks you hard on your head before leaving you to contemplate in solitude and then…contemplate some more! I’d say pick up your copy right away, and savour the delight of some exceptional writing, but leave the hot coffee behind, lest you scald your behind, laughing long and hard. Yeah, that’s what this book is, a complete laugh riot! A Dog Eat Dog-food World positions itself as a ‘hilarious pseudo-history of marketing management’, and this is one instance where the blurb is exactly descriptive of the novel. Through the story of the Fortune family, Spike and hapless nephew Jerry and their business rivals Tom and Jasper Rich, C. Suresh explains (and de-constructs) the theories of management as taught in B-schools the world over. A Dog Eat Dog-food World is a small volume, but it’s brilliance is anything but limited. To catch a A Dog Eat Dog-food World positions itself as a ‘hilarious pseudo-history of marketing management’, and this is one instance where the blurb is exactly descriptive of the novel. Through the story of the Fortune family, Spike and hapless nephew Jerry and their business rivals Tom and Jasper Rich, C. Suresh explains (and de-constructs) the theories of management as taught in B-schools the world over. And so I am finally done doing what I should have, more than a year ago. Reason for delay, you ask? Well, aside from the on-and-off relationship there seems to be going between me and ‘reading’ these last few months, let’s just say I am quite intimidated by books that fit easily into my pocket but are NOT books that are written by or written keeping in mind simple-minded folk. Give you another example, you want me to? Try Heart of Darkness by Joseph Conrad. (96 pages, that to And so I am finally done doing what I should have, more than a year ago. Only difference being, after reading Conrad’s peculiar little pocket dynamite, I was as scared and intimidated as I was before I picked it up. But having finished reading C. Suresh’s peculiar little pocket dynamite, aptly titled A Dog Eat Dog-Food World, I must confess that far from being as intimidated as I was before starting to read, I am now overcome by a most singular smugness, a smugness that comes out in me when I feel I am able to identify with something, like no one else might. Unlike what the synopsis on the back cover of the book claims, A Dog Eat Dog-Food World, atleast for me, did not come across as a pseudo-history of marketing management that bears no resemblance to the actual history. Infact, it may well be one of those rare books that, in trying to capture the history of marketing management- metaphorically or otherwise- cuts so right to the chase that it ends up coming closer to the ‘actual’ history than most other tomes written on the subject by knowledgeable experts ever might. The book begins with an explanation by the author on how history, in the form that is available to us, may or may not be the real deal, considering what gets recorded and what survives the passage of time is but a list of achievements of the few who either achieved something that required them to be ‘active’ or achieved something lesser but still ensured that what they achieved was ‘actively’ promoted. As in History, so in pseudo-history, concludes the little prologue which I found overall to be humorous but agreeable, and also strangely informative. From there we proceed to meet, one by one, the five main characters of the story, each of whom is introduced at different stages of the telling, perhaps so we, the audience, can enjoy better their standalone idiosyncrasies first before the story advances into more complex territory and pits them against one another even as the grand scheme of things becomes clearer with each passing page. The premise is Dog and Cat Foods manufacturing, with Spike Fortune, his nephew Jerry Fortune and their Head of Marketing Tyke playing the masterminds behind the former, and Tom Rich with his nephew Jasper Rich forming the reluctant rivals who mastermind the latter. Fortune starts the business because he wants to lose all his money before he dies and doesn’t know how to, and Rich enters the race as prime competitor, because he has never been second to Tom at anything since school days. Sounds simple, no? Of course it does. And simple it is, but only if I am to think of it in one way- that this is but a simplified version of actual history, not just of marketing management but of the entire world of commerce as we see it in present day. For, as much as I believe that stats and official records have their place of importance and cannot be refuted for a piece of satire that talks in Dog and Cat Foods metaphors, I cannot imagine the history of marketing management (and commerce in general) without a Spike, a Jerry and a Tyke in every place of business that received a mention in the factual history records, and- more so- a Tom and a Jasper in every competing place of business that perhaps didn’t receive a mention on account of it coming second. Afterall, can it not be said that it requires some level of madness- some form of physical or mental disorder, to the conservative eye atleast- for a person to become an entrepreneur and then a competitive businessman? And if that is acceptable, then can it also not be said that the men (and women) who made this History of commerce happen will most-certainly have been as- if not more- idiosyncratic as the five characters portrayed in this novella? Now THAT is what the official records will never tell you. Which is still fine, as I know and acknowledge that functional academics are no place to read about the idiosyncrasies of highly successful people. But THAT is also exactly what makes A Dog Eat Dog-Food World such a rare book. Because, once it is stripped of its circuitous albeit lyrical writing, of its light tone, of its laugh-out-loud moments, and of its effective use of a narrative style that most authors would find hard to execute, A Dog Eat Dog-Food World is a narration of these unrecorded facts that are the reason behind everything that is wrong with commerce today. It is about the sickening condition of today’s corporate environment where employees create invisible fires and douse them noisily to receive recognition and reward without having to do any credible work. It is about the saddening advent of cellphones and how a piece of plastic and metal gets constantly shoved into our faces as an essential fifth limb that no human can survive without. It is about 24/7 news channels who, in their need for one-upmanship, have graduated from impartially presenting current affairs to producing useless noise. And most of all, it is about us, the consumers, the silent protagonists of both History and this story, who allow men of ambition to not just affect our needs and desires, but to outright decide and dictate them for us. In conclusion, this is one novella I would urge any and every person to read, understand and laugh, then read and understand some more, and smile knowingly. On a scale of one to five, I will rate this book a solid four, one point being deducted for making me chew on my words from the earlier paragraph where I mentioned that I was far from feeling scared after finishing the book. To give you a backdrop of why I picked this book up for review, I will start with the honest admission that I got hustled into buying it. I initially knew Suresh as an active member of For Writers, By Authors, a writing-focussed Facebook community that I am also a part of. Upon checking the excerpts he would regularly share from his blog, www.jambudweepam.blogspot.in, I realised this unassuming person was actually one of the top bloggers in India who had won acclaim and accolades from BlogAdda. To give you a backdrop of why I picked this book up for review, I will start with the honest admission that I got hustled into buying it. I initially knew Suresh as an active member of For Writers, By Authors, a writing-focussed Facebook community that I am also a part of. Upon checking the excerpts he would regularly share from his blog, www.jambudweepam.blogspot.in, I realised this unassuming person was actually one of the top bloggers in India who had won acclaim and accolades from BlogAdda. He had even got a book published, curiously titled A Dog Eat Dog-Food World. I read the blurb, liked it, and consigned ADEDFW to the list comprising books I would read some time in the future if and when someone else goes through the effort of releasing a pirated eBook version. That would have been that, but for the fact that almost everyone I knew on the group waxed lyrical about how Suresh had managed to write a literary masterpiece akin to the works of P. G. Wodehouse. That got my goat. With many people claiming to have bought the book and several others writing glorious reviews, I was forced to smash open my piggy bank and sell two packets of my father’s cigarettes in black to place the purchase order for the book. Peer pressure is a dangerous thing, people. It made me do some real bad things. With my illegal activities having escaped the eye of the law and, more importantly, my father, I started reading this ill-acquired tome. Tome is probably the wrong word to use here, for ADEDFW is a sprightly nymph of a novella. Published by Fablery, ADEDFW’s bright yellow cover caught my eye, as did the cover image which had a dog and a cat sitting at a table placing their respective orders with a human waiter. Its blurb, as all good blurbs should, managed to convey what the book was about in very few words and pique my interest at the same time. After all, it is not every day that I managed to get my hands on a satirical pseudo-history of marketing (although now that I have the book, I probably can). The contents inside were just as quirky, and the author managed to, from the very onset, build a very clear outline for his story with impeccable language and interesting characters. There isn’t much I can say about the story that was not mentioned in the blurb without dishing out spoilers. Or rather, I can. I can tell you of Spike Fortune, a hypochondriac whose only aim in life is to spend all the money his ancestors have earned, and how he, by the end of the story, transforms into a consummate businessman hell-bent on making more and more dogs eat his dog-food, whether they wanted to or not. I can write about how his fortuneless (haha!) nephew Jerry, who has never exercised a single grey cell in life, suddenly becomes the fount of revolutionary business ideas. I can extrapolate of the rivalry between Spike and Tom Rich, one of those simmering, amicable socially acceptable feuds which often have their roots in shared classrooms (Sharma-ji ka beta comes to mind when thinking of a middle-class example). We can discuss for hours how the society pushes an unwilling Tom into competing with Spike, and how their rivalry ends up altering the basic fabric of the society in this pseudo-historical world to such an extent that the reader is left wondering just how the author managed to make the leap in just 94 pages. I can tell you all this, and more, and none of it will make a damned bit of difference. Not. One. Bit. See, this is where Suresh’s innate humour and storytelling ability come into the picture. Spike will not be Spike without Suresh’s expert hand guiding him through his journey from the deathbed to the treadmill of commercial success, Jerry will not have come up with a paradigm-changing idea of selling dog-food to dog owners had it not been for the author’s subtly pulling the threads behind the scenes, and the world would not have changed (for the better, one hopes. This is the inception of marketing we’re talking about, after all) without the delightful progression of events right up to the climax. Without reading the book, any retelling will be, at best, a boring, mundane affair, much like boiled dal without tadka. It is Suresh, with his effortless prose and near flawless execution, who adds various flavours to the mix. He, with the cunningness and guile of a seasoned (and marinated) veteran, makes you stack up all the dominoes, entering only to knock them all down once everything is in place and leave you wondering just how it was that he managed it. A title so catchy and cover so intriguing that says upfront it is not just another book. A novella of 95 odd pages that would take not more than an hour to read, that talks a lot about the marketing management. Suresh – an author famous for his humor peppered blog, well, what can you expect from him? A hilarious take on the marketing management! The prologue is super interesting – it surmises the concept “Out-of-the-box” literally! It makes you think. That ting moment! Now that A title so catchy and cover so intriguing that says upfront it is not just another book. A novella of 95 odd pages that would take not more than an hour to read, that talks a lot about the marketing management. Suresh – an author famous for his humor peppered blog, well, what can you expect from him? A hilarious take on the marketing management! Now that the prologue makes you read and just scroll, scroll, and scroll (because I got the eBook from the book club) – tadaa! I finished the book in one go! Author Suresh has a very unique style, and it suits the satire really well. It is not just pseudo history and marketing management, but there are quotes on life as such which makes you introspect and save it for life. What I loved in this book? At the surface level, it comes across as a business case-study for marketing student and corporate discussions. At a deeper level, it questions the way corporates and businesses function. At a metaphorical level, it laments in the guise of humour, the abject condition of the world/society/humanity! Where do I start? It was a brutally honest portrayal of marketing management with an ample dose of humor raining over it. I read the book back-to-back twice on the same day. After the second read, I sighed deeply winding down the last chapter as my thought took off on numerous tangents – both at a macro and micro level – philosophy of life in general, general principles of business, ethics of conducting business and more. However, the first thought that hit me was the Murphy’s Law – ‘To err is hum Where do I start? It was a brutally honest portrayal of marketing management with an ample dose of humor raining over it. I read the book back-to-back twice on the same day. The author claims it to be a pseudo-history of marketing management but, the story unfolds like a flower in an environment where blooming depends grossly on the conditions suitable for it to reach full growth and maturity; very similar to how things change in a marketing world, when one maneuvers the odds to excel, where change is the only constant. An idea born takes its own course to either reach zenith of monetary benefits or escalates down to the nadir leading to discarding the idea. ‘Dog eat dog food world’ is one such journey of Spike Fortune and Tom Rich, where they constantly have to rediscover themselves and their strategies of conducting business, to stay ahead in the game. As the old adage goes – necessity is the mother (and father) of invention! I am not going into the story as the blurb above does a substantially adequate job. Now, there are a few things that definitely need an appreciation. My heartfelt congratulations to C. Suresh for writing a brilliant satire. The read is seamless with magnificent flow and sleek choice of words. Also humor as a literary technique is under-explored and is definitely a welcome change (more so as it is difficult to pull off). Writing humor needs a special skill as it can reach the slap-stick kind if not handled well. Suresh did a commendable job. I loved the fact that (although very slim) the book is rich – the human relations aspect, boss is always right angle, a resident genius that spins out theory more than practical solutions, general philosophy of life and business rivals trying to out-do each other were all done well. All these add to the lusciousness of the read. Am sure different readers would take different things from the book and read more to deepen their understanding of things around them. That is the most noteworthy accomplishment for a budding author. Congratulations on pulling it off, effortlessly. There are many more that are sure to draw a chuckle out of every reader. Mr. Suresh, you have a fan for life. I will follow your journey, cheering from the sidelines as you achieve literary growth and accolades. A rib-tickling, howlarious and candid lesson in management! Never knew lessons in marketing and management could be so effectively delivered with so much fun and laughter thrown along the way! All-time favorite toon character namesakes, Tom, Jerry, Spike and Tyke take you on an action-packed and fun-filled journey! What starts off with a morose, down in the dumps Spike Fortune and a happy-go-lucky Jerry, winds off to a whirling dervish Spike and a market savvy Jerry! Adding twists to the tale ar A rib-tickling, howlarious and candid lesson in management! Never knew lessons in marketing and management could be so effectively delivered with so much fun and laughter thrown along the way! All-time favorite toon character namesakes, Tom, Jerry, Spike and Tyke take you on an action-packed and fun-filled journey! What starts off with a morose, down in the dumps Spike Fortune and a happy-go-lucky Jerry, winds off to a whirling dervish Spike and a market savvy Jerry! Adding twists to the tale are Tom Rich and Jasper, offering the reader a more profound insight into the workings of corporate world politics, advertising strategies.....all done innocuously enough without you ceasing to smile! A truly, delightful, entertaining book with terrific language! Kindle reading with inbuilt dictionary helps you with some truly memorable and wonderful vocabulary that the author casually and effortlessly delivers! An unputdownable book, and you have to keep reminding yourself that, it is not the writer of the inimitable Jeeves at work here but a new master, C.Suresh! First of all Congratulations to the author.. for coming out with such an insightful novella..... Having been in the corporate world for over 3 decades I could identify with many situations I have faced, as narrated in the book... Various concepts has been brought about in a very interesting and lucid manner. Don't be deceived by the no of pages of the book... its a treasure and each time you read the book it gave a different perspective. And therefore I recommend that you maintain a steady pace w First of all Congratulations to the author.. for coming out with such an insightful novella..... Having been in the corporate world for over 3 decades I could identify with many situations I have faced, as narrated in the book... Various concepts has been brought about in a very interesting and lucid manner. The humour is contagious and binds well with the story. Waiting for the sequel when dog food goes abroad. "Satire" is a much misused format by humorists with the jokes targetting under-privileged/oppressed sections of the society, rather than the opposite. As I read elsewhere, satire is a weapon of the powerless and not the powerful, because if it IS indeed used by the powerful, then it is no less than vulgar. And sometimes, as in the case of "A Dog Eat Dog-food World", satire is that tongue-in-cheek intelligent set of one liners that trigger silent chuckles, evenly spread throughout the book, without getting into overt exaggerations that have no head or tail. Without digressing any further, let me present to you this hilarious corporate satire penned by Suresh C., that tells you a tale about a pseudo-history in a world similar to ours. Spike Fortune is outrageously rich and has no idea what to do with the wealth that never seems to subside. The thought that he'd be forever trapped in this wealthy rigmarole gives him anxiety attacks, that make him paranoid and a typical nightmare for the doctors. On one such occassion, when he calls his doctor for the anxiety attack caused by boredom, his doctor suggests a way of spending all his money - setting up a business. Spike employs his nephew Jerry to find out a suitable idea for business and Jerry, after getting terribly beaten due to some truly horrific chain of events, suggests a business of dog foods. Thus starts the creation of a pseudo history that will result in a total societal makeover. How does that happen? You got to read the story for that. I'd just leave it here. Suresh has managed the ability to get the readers to snicker with some hilarious sarcastic jibes, while not once moving away from the corporate part of the story. The characters are extremely relatable if you have ever worked in a corporate or even otherwise. The barbs are on the lines of Dilbert and XKCD (I have read a few punches from these and the books are on my wishlist). The rival in the form of Tom Rich, his advisor Jasper, Spike's market research person Tyke - these are all exactly the people we see while at work. The story takes us through the entire cycle from the business idea, to market research, to advertising, to jargons and negative marketing and later to product differentiation and market extension. You may even find traces of some subtle political references here and there. I will go on to say that this Jerome K. Jeromish little book can be a wonderful companion of yours on your commute to or fro from work or if you are homemaker, you can quickly munch it between your chores. Just a pro tip, do not, I repeat, DO NOT read it just before you are about to attend a very heavy-duty corporate meeting. You will keep seeing the faces of the characters in every face present there, you will keep hearing the author's hilarious jibes amidst all the seemingly serious talks and 70% of the meeting will end up with you inside the washroom for the fear of being caught giggling to self. "How is it that all people around you know more about the best way to lead your life than you do yourself?" "If God HAD to create stubborn mules, why did He have to make them look like humans?" "He realized that even rank idiocy could sound like distilled wisdom if dressed up in learned language." "Put two people together to do a job and they are too busy shooting down the other person's ideas to get ahead with the job." "Cats, though, are a shade less likely to feature as indefatigable saviours of distressed mankind. Face them with a drowning man and they would feel the irrepressible need to wash their faces." If you want a quick, light, laughter-inducing read, go for this one. If P G Wodehouse could take a pot-shot at the tenets of marketing management armed with either a rifle of yore or his glorious pen, I doubt if he could come up with a wackier take than what has been accomplished by C Suresh in his 90-page novella/management handbook. Don’t get fooled by its svelteness though! I have read the book numerous times and discovered new layers each time, which in part explains this late review. The other part I very much attribute to indolence, like the ills of hypocho If P G Wodehouse could take a pot-shot at the tenets of marketing management armed with either a rifle of yore or his glorious pen, I doubt if he could come up with a wackier take than what has been accomplished by C Suresh in his 90-page novella/management handbook. Don’t get fooled by its svelteness though! I have read the book numerous times and discovered new layers each time, which in part explains this late review. The other part I very much attribute to indolence, like the ills of hypochondria that beleaguers Spike Fortune, the book’s principal protagonist/ antagonist, till a chance remark by his doctor alters the somnambulant course of his petulant existence. The book examines and questions many principles of modern day marketing strategy through the hilarious and delightful skirmishes between Spike and Tom and their respective deputies Jerry and Jasper. Spike decides to spike his wretched existence and his utter disdain of his pointless opulence with his dog-food business and his rival from his school days Tom does likewise with the cat-food business. Laced with zany humour and impeccable language the author introduces market and customer segmentation, branding, advertisement, product extension, differentiation, segmentation, geographic extension and what have you. Yes, even the BCG matrix, jargonising, management consultants, employee one-upmanship and junior subservience is not spared; all delivered with panache and the acid of scathing humour dripping from Suresh’s pen. Examine these gems from the book: “You are not paid to think Jerry! Just do as you are told.” Spike did not realise that he had just set the conversational trend for all employers for some time to come. Countless nuggets such as these are sprinkled generously throughout the book and makes ‘A Dog Eat Dog-Food World’, not only unputdownable but perhaps a book you would want to return to, like your favourite dish, to savour a forgotten taste. No, this is not a stiff upper-lip sermon on marketing edicts. No graphs, no bar charts, no statistics, no point to be hammered home other than this perhaps that we take ourselves far too seriously than anyone else does. Neither is it an engaging story waiting to be told. It’s a breezy, uncomplicated explanations of key marketing tenets woven in a simple story of human foibles. What I would have liked to see more of is perhaps extension of the story into the foray of Spike and Tom into export marketing and the many learnings therein. Perhaps Suresh would contemplate a second part of the book? In the prologue, Suresh makes an engaging point about the nuances between making one’s place in history and making history. I sincerely wish that ‘A Dog Eat Dog-Food World’ makes history in spurring other writers of fiction and non-fiction to deliver serious concepts in a light, storyteller’s fashion. Peachy any day, rather than preachy. For the first time, I decided to skip writing my version of the story in the review. The blurb does a better job and I am no humor writer. So check out the blurb of this book - here - before you read any further. For a book that mocks the whole concept of marketing, the characters of the story were surprisingly well developed and built piece by piece. My favourite character was of course Spike, who reminded me of a certain someone from own life – the dumb guy who can’t even understand plain English. With immaculate sentence phrasing and writing as smooth as butter, the story turned out to be delightful read. Can you imagine Kotler-ish marketing strategies laid out is a Wodehousian way? Well, this writer did just that. I thought I was the only reader who thought so, until I was pleasantly surprised when a couple of other reviewers mentioned the same. This obviously implies the story effectively conveyed what the writer intended to. In fact, I got weird looks from people around me when I was reading this book as I was doubling up with laughter. Some people are simply blessed with a bigger funny bone and drop down laughing at the slightest hint of humor; I don’t belong to that category. Yet, there I was laughing my head off reading the book.The plot had me all pondering well after I finished the book. Such was the story! MY SAY: One must read book! Ps. I NORMALLY DON’T GIVE OUT A 5, THERE IS ALWAYS ALMOST SOMETHING IN THE WRITING THAT TURNS ME OFF. THIS BOOK SEEMS TO BE FIRST EXECPTION. NO COMPLAINTS. NONE WHATSOEVER. Suresh writes this amazing pseudo history about how things came by. You discover the roots of so many things that you take for granted and if i were to mention those things here, i would have to mark my review with 'spoiler alert'. I have already revealed enough in the earlier paragraph. There is always a special place in my heart for books written by fellow bloggers, added to it the fact that some of them are such amazing authors that it is a pure joy reading their books. It feels proud to see them in print knowing that this is a very deserved progress for their writing. C Suresh is one such blogger. Having known him through social media I have had the chance to read his blogs very often. I have giggled and laughed at his thoughts on this otherwise dull world which is busy doin There is always a special place in my heart for books written by fellow bloggers, added to it the fact that some of them are such amazing authors that it is a pure joy reading their books. It feels proud to see them in print knowing that this is a very deserved progress for their writing. C Suresh is one such blogger. Having known him through social media I have had the chance to read his blogs very often. I have giggled and laughed at his thoughts on this otherwise dull world which is busy doing things of least importance. Suresh seems to have a special pair of glasses through which he makes his readers see this world and makes them notice things which otherwise till then went unnoticed. When I was approached to review his book it was a HUGE yes for me, who wouldn't want to add a healthy dose of laughter to their lives! This book was a fun read. A riveting package of humor and management. The war between two businesses in the dog-food and cat-food world unfolded into a story where we witness first hand, how a product strategy evolves as a product gets conceptualized, to its brand positioning, marketing and its subsequent pivots and extension strategies. The humor reminded me of P.G Wodehouse and when applied to management principles like product life cycle, product differentiation etc , it threw up some really i This book was a fun read. A riveting package of humor and management. When one of India's top-ranked humour bloggers comes out with his first solo book, you buy it and read it. This is a slim book a novella. It traces the rise of two businessmen and their associates. One in the dogfood business and the other in cat food. Hilarious with marketing and B-school theories reinterpreted, the author is a qualified B-School alumnus and knows what he is talking about. Do read this book, full fun, full time pass and a pseudo history of Business and Marketing in tongue and ch When one of India's top-ranked humour bloggers comes out with his first solo book, you buy it and read it. This is a slim book a novella. It traces the rise of two businessmen and their associates. One in the dogfood business and the other in cat food. A wonderfully narrated satire on management consulting, consumption patterns and everything that a business can think of. I loved the mild satire which almost makes the reader think and rethink while not compromising on the comedy. Satire, actually is not my forte and this was a book I chose to read to challenge my own comfort zones w.r.t genres. Happy with the choice. The MBAs will love this one. A refreshingly different book. The fact that such books are able to find a market and entertain readers gives hope that there is a place in the market for intelligent books. Hilarious but not in a slapstick manner, the story will make you chuckle at every page. A breezy read that will leave you smiling as you turn the last page. A hilarious, yet, disturbingly true take on how the cunning art of marketing has shaped our lives and made us victims of a shifting culture. Through the examples of dogs, cats and all the paraphernalia that come with them, Suresh has wrought a riotous pseudo-history to dull the original into shadow. For all you MBA marketeers, here's a half a day's read to leave a longlasting smile. It is not often I get to write reviews and it took me a loong time to write one. But it was a interesting read reminding me of all those Wodehouse books I read loong ago. It was a treat to read how the marketing management process works in a funny and simple language. A must read.